Since the start of Google's autonomous driving project six years ago Goole Self Driving cars have been involved in just 11 'light damage' accidents. According to a blog post by Chris Urmson, director of Google's self-driving car program, none of the accidents were caused by the Google car. 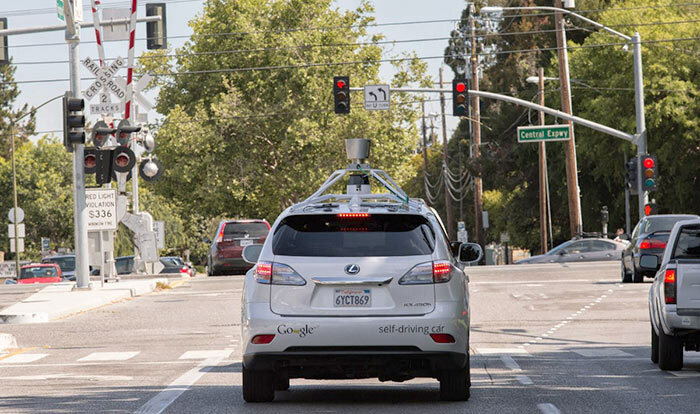 Google's fleet of 20+ self driving cars have driven around 1.7 million miles (manually and autonomously combined). The autonomous portion of that distance accounts for over a million miles, mostly on city streets. Currently the project is covering about 10,000 miles per week. As mentioned in the intro, so far, Google self driving cars have been involved in just 11 accidents. "Not once was the self-driving car the cause of the accident," writes Google's Urmson, with emphasis. The most common accidents the self driving car endured were rear-end bumps. That correlates with the most common type of accidents with no autonomous vehicles involved. However in all the rear-end bump cases, 7 of the 11 accidents that the car was involved in, it was the Google car which was rear-ended. It is noted that it's hard for the not-at-fault party to avoid this kind of accident which occurs mainly at traffic lights. The rest of the accidents the Google self-driving cars were involved in included two where it was sideswiped and one where the other car went through a red light. Minor accidents such as those experienced by the autonomous vehicles are rather a new field of study as, first of all – they are minor, and secondly they are not often reported. Now Google is looking at traffic and road collisions of this type it is seeing trends in what causes accidents and leading indicators of significant accidents. A particularly interesting observation by the Google car safety drivers is that "In any given daylight moment in America, there are 660,000 people behind the wheel who are checking their devices instead of watching the road". After so much mileage Google is now confident to say that its autonomous vehicles offer better road safety than humans. This is mainly down to "360 degree visibility and 100% attention out in all directions at all times; our newest sensors can keep track of other vehicles, cyclists, and pedestrians out to a distance of nearly two football fields". Google is continuing its work on self driving cars and now we must start to wonder when both electric cars and self driving cars will make up the majority of vehicles on the road. I don't like this, I prefer to drive and I prefer cheaper insurance. Same here, So I take my 3DS and get on the bus. Shows as safe as these cars are you can't stop people hitting them, same goes with a good driver. If all cars were autonomous then they'd probably reduce the number of shunts. It's always people at fault. Even the best drivers can suffer from the occasional lapse in concentration or distraction, but I wouldn't want the car to do all of the driving, I just want them to assist in accident prevention.